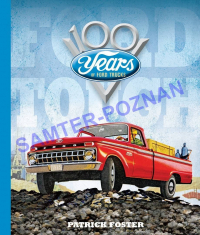 Get Fords complete story in Ford Tough: 100 Years of Ford Trucks and see why they’ve dominated the truck market, selling 1.5 million trucks every year in the US alone. In July 1917 Ford Motor Company introduced a one-ton chassis for commercial trucks, marking what many historians feel was its official entry into the dedicated truck business. Sure, after-market pickup beds could be added to a Model T car to convert it to a pickup, but with the debut of the rugged Model TT truck chassis, Ford was firmly in the truck market. Eight years later, Ford introduced its first factory-produced pickup, a sturdy half-ton job the public loved. During the century that has passed since that first Ford truck chassis, the F-series has become the best-selling truck in the world, and the best-selling vehicle of any type in America.